Completely handmade of silks, brocades and taffetas, this quilt (87" x 88") is a delight to the eyes! 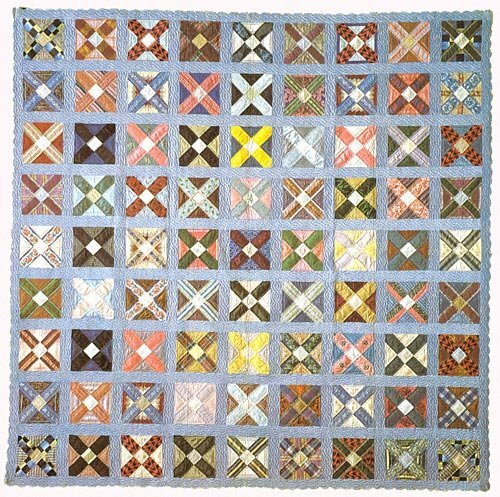 The fabrics are as stunning now as they were in 1852 when this signature quilt was completed. The sashings and scalloped border are quilted with a beautiful cable design. In the center of each square is a signature or verse, all written in incredibly gorgeous calligraphy. Five of the center squares have delightful watercolor artwork containing hearts, banners and flowers. All of the readable signatures and verses are included in the pattern. Perhaps you'll find the name of a distant relative! Also included are stencils for replicating the five watercolored squares - and the quilted cable design. A color page entitled a " Fabric Fashion Show" entitles you to a close-up view of some of the spectacular fabrics in this enchanting quilt. Rotary and hand-piecing dimensions are given. Acrylic templates for the Elizabeth Green Quilt are also available!